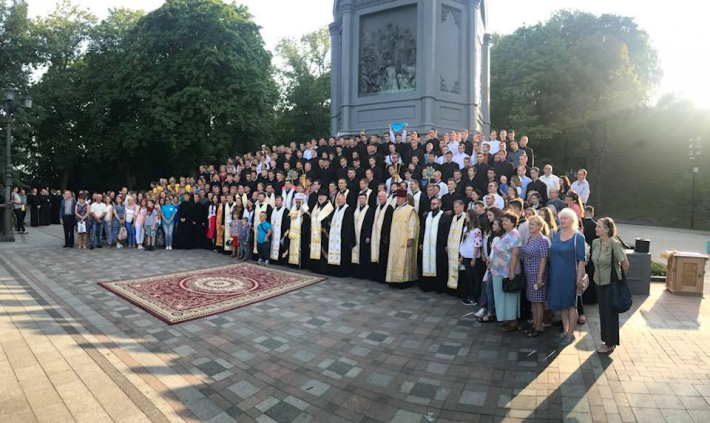 His Beatitude Sviatoslav, the Father and the Head of the Ukrainian Greek Catholic Church, served the Moleben’ near the monument to the Equal-to-the-Apostles Prince Volodymyr on the occasion of the 1030th anniversary of the Baptism of Rus’-Ukraine. First of all, the Head of the UGCC congratulated everyone on the anniversary of the Baptism of Rus’-Ukraine, which we celebrate this year. The Вishop reminded that the driving force of the Renaissance, which was experienced by Europe, was the slogan "To the sources" (Ad fontes). Тhe Head of the Church noticed that the source is something that, on the one hand, gives us a chance to revive. "Everyone who returns to the sources, as if finding himself, begins to understand who he is. And from that source, he takes strength to look into the future, in order to live and develop. Every rebirth means a new life, a new breath, a new era, a new future," said His Beatitude Sviatoslav. "When we celebrate the Вaptism of our people," the Head of the Church said, "we are returning to the source which in the Christian sense is always a word in singular. For there is one source of life, an untimely and therefore eternal life. The source that flows forever is the person of God the Father. We exist because God the Father feeds us, as everything created in this world. "From that source we can scoop up the living water of the Holy Spirit, as if from the well, through the incarnation of our Lord Jesus Christ. And we can be participants of the eternal life precisely because we were brought to the baptismal font. In it we have experienced a new creation of water and spirit. Therefore, the celebration of this event means to return to the source. Taste again the source of life that is given to us by the Son in the Holy Spirit. I think that for this reason we all have come here, to the baptismal font of the Ukrainian Jordan, our Dnipro, - so that we could experience personal Christian revival," says the spiritual leader of the Ukrainian Greek Catholics. However, in the opinion of the Head of the UGCC, if we celebrate a certain event from year to year, but do not become better Christians, then those celebrations will not bear any fruit. In the opinion of His Beatitude Sviatoslav, the purpose of this prayer is to look into the future. "Therefore, there is such a great privilege to celebrate this jubilee of Вaptism with the faithful youth. Being baptized in the name of the Father, the Son and the Holy Spirit, they renew their baptism from day to day in theіr daily life. And on this basis they build their personal, church, academic, social, and national life. Standing here, on these holy Kуivan Mountains, we have the opportunity to see in a visible way the sources, the origins of our Church. This Church has been passing down this precious treasure of faith of the Equal-to-the-Apostles Prince Vоlоdуmуr for 1030 years," said the Primate. The Primate stressed that our Church is not just an heir, but the successor of the Kyivan Church that values her history. And in this identity she looks into thе future. May we pray today, called His Beatitude Sviatoslav, so that each of us could reach the sources - the sources of one’s spiritual life. Let each of us experience a revival of water and spirit, so that here we may feel that the Lord is opening a new era of our Сhurch, national and state existence. Return home, carry in your heart the living water of the Holy Spirit, which Heavenly Father wants to give us through His Son. The Head of the Church urged all brothers and sisters to pray for our Church, for this is the commandment of our great father and teacher His Beatitude Lubomyr.